France’s second-largest lender says it will more than double its dividend, which sent its shares up 5 pct. The bank has put the dark days of 2011 behind it, but return on equity is still sub-5 pct. Investors must wait until May for details on how SocGen wants to take it higher. France’s Societe Generale pledged on Feb. 12 to pay a 2013 dividend of 1 euro per share, up from 0.45 euros in 2012, as it reported a fourth-quarter net profit of 322 million euros. The bank said French retail banking and corporate finance performed well. SocGen reported a 471 million loss for the same period a year earlier. SocGen also boosted its Basel III core Tier 1 capital ratio by 10 basis points to 10.0 percent over the three months to December. Its leverage ratio was 3.5 percent at the end of December, based on the Basel rules published in June. 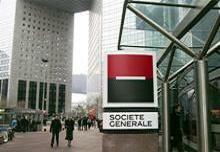 SocGen’s group made a 4.4 percent return on equity (ROE) for 2013. Excluding legacy assets and one-offs, the ROE was 8.4 percent. SocGen said it would present a strategic plan on May 13 on how to improve the ROE to 10 percent from end-2015. Chief Executive Frederic Oudea told Reuters that SocGen’s bonus pool for 2013 would be down from 2012 as a result of a 446 million euro fine levied by the European Commission after one of the bank’s employees attempted to manipulate the benchmark Euribor interest rate. By 1230 GMT, shares in SocGen were up more than 5 percent as the wider CAC40 index traded up 0.4 percent.